Surprise that special someone with this fun modern version of a dozen roses. Your sweetheart will be tickled pink by this alternative to the traditional red roses. 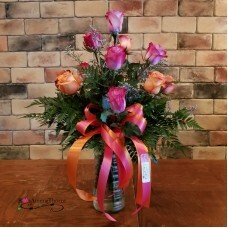 This versatile arrangement can also be given to a friend or co-worker. The mix of romantic deep purple roses and lovely peach roses will make your favorite someone smile all the way to their heart!